Lease Terms: Security Deposit due at lease signing. Tenants are responsible for all utilities. Landlord is responsible for lawn care and snow removal. Cats and small dogs permitted, with some breed and weight restrictions. Any pet is an extra $30 per month and $30 for the security deposit. Renter's Insurance required. Description: 4 BRAND NEW DUPLEXES (Under Construction). 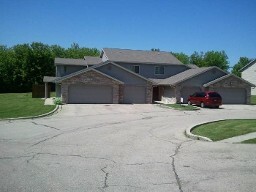 This gorgeous 1600 square foot split entry duplex located in Marshall is only a 1/2 block from the lake! The upper level has an open concept living room, dining room area/kitchen combo, and the master bedroom with full bath. The lower level has the family room, 2nd and 3rd bedroom, full bath, and a storage area w/ washer and dryer hookups (washer and dryer not included). 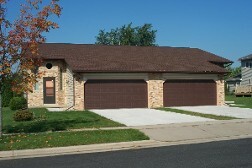 This unit has an Attached large 2 car garage, deck, and a GREAT VIEW of the lake from each unit!!! The finished photos will give you an idea on the what they will look like when finished. Lease Terms: Tenant is responsible for all utilities. Lawn care and snow removal is provided by the landlord. Small dogs allowed for an additional $30 per month and $30 for the security deposit. The security deposit is equal to one months rent and is due at lease signing. Description: GORGEOUS BRAND NEW CONSTRUCTION! This stunning and spacious townhouse features a master suite with full master bathroom and large closet, 2 additional large bedrooms, and an addition 1 and a half bathrooms. Stainless steel appliances, chocolate or taupe colored kitchen cabinets, and beautiful flooring throughout add even more allure to this home. Cozy up to the beauty and convenience of a gas fireplace or enjoy spending time in the lower level family room. 2 car attached garage and washer and dryer are also included in the 2nd floor laundry room. Lease Terms: Tenant is responsible for all utilities. Landlord is responsible for snow removal and lawn maintenance. Security deposit is due at lease signing. Cats are an additional $30/month and $30 on the security deposit. Renter's insurance is required. Description: This AMAZING 2 bedroom and 1 bath 2nd floor apartment is 2 blocks away from LAKE RIPLEY. This unit features a 1 car garage with additional parking pad and 1100 sq ft of spacious living space. There is a coin-op washer and dryer in the building for residential use. This unit has a VERY affordable rent that comes with wall unit AC, a patio, and large yard! 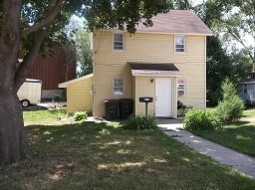 Description: This LOVELY lower unit, 2 bedroom and 1 bath apartment is 2 blocks away from LAKE RIPLEY. This unit features a 1 car garage with additional parking pad and 1100 sq ft of spacious living space. There is a coin-op washer and dryer in the building for residential use. This unit has a VERY affordable rent that comes with wall unit AC, a patio, and large yard! Lease Terms: Tenant is responsible for all utilities, snow removal & lawn care. Landlord will provide lawnmower. Small dogs permitted, with some breed restrictions. Cats/small dogs are an additional $30/month and $30 on the security deposit. Renters insurance is required. The security deposit is due at lease signing. Description: Great upper level 1 bedroom apartment near downtown Stoughton! 1 bathroom, private entry & forced heat! Washer/dryer hook-ups are available in the shared basement. Easy access to Hwy 51 & Hwy N! Close to grocery stores, Walmart & the towns movie theater! Lease Terms: Available 6/1/2019. Tenant is responsible for all utilities, snow removal and lawn maintenance. Security deposit is due at lease signing. No Pets Allowed. Renter's insurance is required. Description: GORGEOUS 3 bedroom split level duplex available on Crawford Drive. The lower level has 3 bedrooms, a full bathroom, and utility/storage area with washer and dryer hookups (washer and dryer are not included). Upper level includes a large living, dining room, half bathroom, and a huge kitchen with walk-in pantry. Finished deck with walkout to back yard. Attached two car garage. Lease Terms: Tenant pays all utilities, water is cost allocated. Landlord provides lawn care and snow removal. Renters insurance is required. NO PETS ALLOWED. Description: This spacious 2 bedroom 2 bathroom is tucked away in a quiet neighborhood in McFarland. This apartment includes a gas fireplace. A 1 car attached garage and a washer/dryer is also included with this unit. There is a limited access entrance to the building. Lease Terms: Tenant is responsible for all utilities. Landlord is responsible for lawn care and snow removal. Renters insurance is required. Small dog would be considered with breed restrictions and a weight restriction of 25 pounds. Any dog is an extra $30 per month and $30 for the security deposit. Description: Great apartment with beautifully landscaped yard area, 1/2 block from the baseball diamond and 1 block from Lake Wabesa. This upper unit has 2 bedrooms, 1 bathroom, and a one-car garage, coin-operated washer and dryer in the building, and a balcony / deck off of the living room. An open floor plan throughout the kitchen, living and dining area makes this spacious apartment seem even bigger!